John and I took a selfie in Borneo. More to follow about Borneo. Yes, I wrote, “Borneo”, like, “the wild lady of Borneo” and land of headhunters. cut hair at youth hostels to help fund her travel expeditions. If only I had thought of that. I wanted to finish my year in Manchester studying and at least get my credit as a Junior and then hit the rails again the following summer. I could easily see myself getting lost from one city to the next exploring all the amazing treasures and meeting eccentric and fabulous people. To save money, I zig zagged across Europe and slept on the train instead of a hostel. I took a train from Marseille, France to Budapest. Granted, this wasn’t a long, restful sleep but, it saved me money and the trains were safe in comparison to sleeping well, outside exposed to the elements and things that go bump in the night. John in KL’s China Town. We picked up a few intestinal parasites from the food and he’s pointing out why. Raw snails in plastic cups in 90 degree heat. No, we didn’t eat these but, the parasites abound! Traveler beware. The problem with traveling like I did was that as soon as I landed in a city and began my exploration, I began thinking about my next plans. For my mindful folks who are thinking that I should have stayed in the moment, thinking about my next plans was exhilarating and thrilling. To think of all the possibilities that lay before me and to weigh my choices. To map out my next move, how long it would take (so I could sleep on the train), what I would see and if the city moved me moved me and made me feel so alive. My mind raced thinking about which places I could travel from Barcelona. Would I head to Nice, try for Lisbon, or maybe head to Austria? I was so close to so many places. And if I went to Austria, where would I go from there-Ireland, Scotland, or Prague? 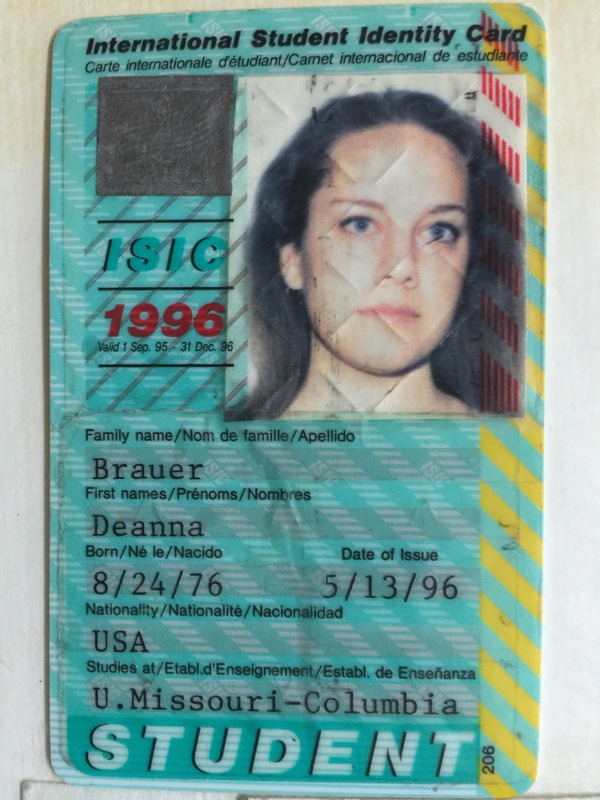 this was my international student ID card. I can’t explain why I wasnt smiling. I was super excited to get this ID. Sleeping and traveling on a train was romantic in your early 20’s. The sound of the trains thudded like the beating of a heart and lulled you to a trance-like state. I saw amazing scenery I wouldn’t normally have been able to see. The cabins allowed for visitors which could be okay and not so okay. I have some stories about that… The window in the cabin could be opened to let in fresh air. Staring out to the countryside gave me a sense of peace and relaxation. It was a great time to rest and reflect. If I wasn’t on a train or sleeping, I was constantly going. Our 4 kids. Don’t freak out. If you haven’t read my earlier posts. John and I have kids from different marriages. We don’t have any funny business going on! So, the problem with traveling to Kuala Lumpur to meet my amazing and darling husband was that the thinking I had on the rail system in Europe zoomed right back to me. From Kuala Lumpur, John and I could go to Vietnam or Japan or India even! I could see the Taj Mahal. I was electrified. But no, I had a parenting plan back in the middle of America and 2 kids who were already lamenting my current travel and counting the days until I returned. Ahhh. I was so close to so many other places and people and crazy foods. I wanted to become a gypsy and live out of my backpack. Without these anchors, I would be off to the world and perhaps lost for a while.